Raw Chef extraordinaire Sarahfae of Addicted to Veggies recommends this savory tart recipe if you are looking for something new and fun to share with your friends at a summer barbecue or picnic! 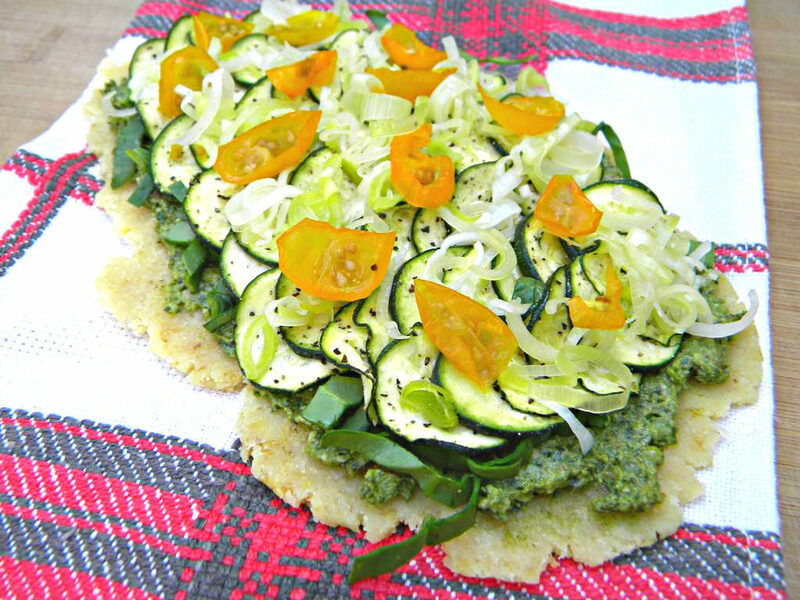 Even the fussiest eaters will like this recipe, and you don’t have to be down with raw foods to thoroughly enjoy the delicious flavors of this recipe’s buttery flax crust, creamy carrot-top pesto, soft and richly flavorful caramelized onions, tender wilted zucchini, and fresh spinach and tomatoes! Spread the Leeks evenly out onto a dehydrator sheet or parchment lined baking sheet and warm/wild for 45 minutes at 118 degrees F. Your finished Leek should be slightly wilted, tender and yummy! 3) Scrape the bottom and sides of your food processor as some of the Cashew mixture may begin to collect. 4) Leave everything in your food processor and move on to the next step. 8) Let your processor puree for 30 seconds in between EACH 1/4 cup of water added. This means you will be adding 1/4 cup of water 5 times until you have added the total 1 and 1/4 cup of water that the recipe calls for. Your finished product will be a fairly thin consistency, and it will need time to chill and set in the fridge for at least an hour. After your Sour Cream has chilled it will have thickened into the perfect consistency. Store Sour Cream in an air tight container and it will last for up to three weeks in your fridge. You can also divide it in small batches and it will keep for up to three months in your freezer. 1) Chiffonade or roughly chop up some Spinach (as much as you’d like to pile onto your tart). Spread on layer of pesto, a layer of zucchini, carmalized leeks, and a generous amount of spinach chiffonade and wilted cherry tomatoes (optional). Eat it Warm or Chilled: You can transfer this whole tart back into either the dehydrator or oven and warm it for an hour, or eat it as-is/chilled.